ABSTRACT. Atubular glomeruli (AG) have been described in several renal disorders. However, little attention has been paid to AG in diabetic nephropathy (DN). Preliminary studies suggested that tip lesions were frequently present in type 1 diabetic (D) patients with proteinuria. The aim of this study was to determine the frequency of AG and their possible relationship with tip lesions in DN. Renal biopsies from eight proteinuric type 1 D patients with normal to moderately reduced GFR (76 ± 26 ml/min per 1.73 m2) and eight normal subjects were studied by light (LM) and electron microscopy (EM). Glomerular volume, volume of the glomerular corpuscle, which is tuft, and the fractional volumes of proximal, distal, and atrophic tubules per cortex were estimated using appropriate stereologic methods. Glomerulotubular junctions were examined on serial sections and classified into glomeruli attached to: normal tubules (NT); short atrophic tubules (SAT); long atrophic tubules (LAT); atrophic tubules with no observable glomerular opening (ATNO); and atubular glomeruli (AG). EM studies showed typical diabetic changes in biopsies, including increased GBM width (P < 0.00001) and mesangial fractional volume (P < 0.0001) and decreased filtration surface density (P < 0.01) compared with normal subjects. Seventeen percent of glomeruli in the D patients were atubular, and 51% were attached to atrophic tubules. Tip lesions were present in all SAT, 64% of LAT, 82% of ATNO, and only 9% of NT and were never observed in normal subjects. The relative volume of AG was smaller than glomeruli in other categories (P < 0.05). Fractional volume of proximal (P < 0.01) and distal (P <0.01) tubules per cortex were decreased, while fractional volume of cortical interstitium (P <0.00001) and atrophic tubules (P <0.01) were increased in D patients. Fractional volume of atrophic tubules, %AG, and percent of glomeruli with tip lesion explained 94% of the GFR variability in diabetic patients (P <0.05). Thus, AG and glomerulotubular junction abnormalities may be important in the development and progression of DN. Atubular glomeruli (AG) have been described in several renal disorders (1,2 ⇓). AG, by definition, have open circulation but no observable tubular attachment and are thus presumably nonfunctioning (3). This phenomenon, first described by Oliver (4) as a finding in chronic Bright disease in humans, had been confirmed in experimental chronic pyelonephritis (5,6 ⇓). Marcussen et al. (7–13 ⇓ ⇓ ⇓ ⇓ ⇓ ⇓) studied atubular glomeruli in cisplatin- and lithium-induced nephropathies in rats and chronic pyelonephritis and renal artery stenosis in humans. More recently, this phenomenon was documented in Adriamycin-induced nephrosis and the remnant kidney model in rats (14,15 ⇓). An important contribution of AG to renal function impairment has been hypothesized (2,15 ⇓). However, despite that 44% of all new cases of end-stage renal disease in the United States are due to diabetes, little attention has been paid to the possible role of this entity in diabetic nephropathy (1,2 ⇓). Pagtalunan et al. (16), in a study of type 2 diabetic Pima Indian patients, did not find any AG. Tip lesions have been described in a variety of renal diseases associated with heavy proteinuria. Tip lesions are characterized by focal segmental glomerulosclerosis with tuft adhesion at the point of the proximal tubular take-off from the Bowman’s capsule, often accompanied by tubular damage (17–19 ⇓ ⇓). Our preliminary studies suggested that this lesion was frequently present in diabetic patients with proteinuria. No detailed study has been published of these phenomena in diabetic nephropathy (19). The present study determines the frequency of AG in proteinuric diabetic patients, considers the possible relationship between tip lesions and atubular glomeruli, and develops a hypothetical model for the functional importance of these lesions. Percutaneous research renal biopsies, obtained with a 14-gauge Vim-Silverman needle, were selected for study from eight (four male; four female) type I diabetic patients ages 37 ± 7 (25 to 47) yr [mean ± SD (range)] with proteinuria [urinary albumin excretion rate (AER) ≥200 μg/min] and mild-to-moderate impairment of renal function (GFR ≥ 50 ml/min per 1.73 m2). Diabetes duration was 23 ± 7 (16 to 34) yr. Eight (three male; five female) normal living kidney donors ages 32 ± 6 (24 to 40) yr were selected as control subjects. All cases were studied by electron microscopy (EM) and light microscopy (LM). All research biopsies in patients and control subjects were performed with permission of the Committee on the Use of Human Subjects in Research at the University of Minnesota and after informed consents were obtained. All diabetic patients were admitted to the General Clinical Research Center (GCRC) for these studies. AER was measured using a flourometric assay on multiple inpatient 24-h urine collections, carefully obtained in the GCRC (20). GFR was estimated by the clearance of iothalamate in four timed urine and blood collection periods in five cases, as described previously (21). GFR was also estimated in all patients by multiple GCRC-performed creatinine clearances using the Jaffe reaction on serum and urine (22). There was a near perfect correlation between GFR estimated by iothalamate and creatinine clearance (r = 0.94, P < 0.05); therefore, the latter was used for the structural-functional relationship described below. BP was determined as the mean value of multiple measurements done in the GCRC using automated equipment. Hypertension was defined as systolic or diastolic BP ≥ 135 or 85 mmHg, respectively (23) or the need for antihypertensive drugs. Hemoglobin A1C was measured by HPLC. Tissues were fixed in Zenker solution, embedded in paraffin, serially sectioned at 5-μm thickness onto sequentially numbered slides, and stained with periodic acid-Schiff (PAS). A BH-2 Olympus microscope (Olympus, Japan) was used to project the slides onto a white plane for stereologic studies. Glomerular volume, the volume of the urinary space surrounding the tuft, and the number of sclerosed glomeruli were estimated at 150×; all other LM studies were done at a magnification of 300×. Glomeruli were sampled on serial sections using the disector principle (24). Only complete glomeruli, including Bowman’s capsule, were included in the study. Glomeruli closer than one average glomerular radius to the artificial edges of the tissue sections were excluded to prevent the bias of including more complete smaller glomeruli in the disector box (25). A mean of 9 (6 to 12) glomeruli per biopsy were studied. Glomerular volume and the volume of the urinary space in the corpuscle surrounding the glomerular tuft were estimated using the Cavalieri principle (26). Sclerosis was defined as capillary loop collapse with loss of normal glomerular architecture often accompanied by fibrosis. Globally sclerosed glomeruli (SG), defined as an estimated ≥ 75% sclerosis, were enumerated but not included in any morphometric measurements. Tip lesions, defined as described previously by Howie et al. (17,18 ⇓), consisted of dilated capillary loops close to the glomerulotubular junction (tip), with or without mesangiolysis, sometimes filled with foamy cells or PAS-positive hyaline material, with adhesion to Bowman’s capsule (Figire 1A). It may sometimes be difficult to differentiate a true adhesion from a simple point of contact of the glomerular tuft with the parietal epithelium; therefore, confirmation of an adhesion was made on serial sections, taking into consideration the pathologic characteristics of adhesions discussed above. Figure 1. (A) A glomerulus attached to a normal tubule (NT). * Glomerulotubular junction. (B) (i) A golmerulus attached to a short atrophic tubule (SAT), with a tip lesion at glomerulotubular junction. PAS-stained; magnification, ×630. (ii) A higher-magnification view of the tip lesion, allowing better appreciation of a dilated loop (*), with foam cells within the tip lesion and flat epithelial cells (arrow) covering the very beginning of the proximal tubule. (C) An atubular glomerulus (AG). The glomerular tuft is indistinguishable from other glomeruli. Bowman’s capsule is markedly thickened and wrinkled at a site opposite to the vascular pole, where a tubular connection is expected. ↔, reduplicated Bowman’s capsule; arrowhead, a spindle-shape cell within the reduplicated Bowman’s capsule; arrow, atrophic tubules adjacent to the atubular glomerulus; * periglomerular fibrosis. PAS-stained; magnification, ×630. Bowman’s capsule was examined in every section of every non-sclerosed glomerulus to find the glomerulotubular junction (GTJ). GTJ were classified as: NT, normal tubule at GTJ (Figire 1A); AT, atrophic tubule with flattened epithelium, lacking brush borders, or no epithelium in association with tubular basement membrane (TBM) thickening; or AG, atubular glomerulus when no tubular connection was observed (Figure 1C). Three subcategories were recognizable in the AT category, including short atrophic tubules (SAT) characterized by tubular atrophy over a very short length (a few cells) at the very beginning of the proximal tubule (Figure 1B), long atrophic tubules (LAT) with tubular atrophy over a longer segment of proximal tubule (Figure 2) and atrophic tubules with no observable glomerular opening (ATNO), where Bowman’s capsule was connected to TBM with no observable connection between the glomerular urinary space and proximal tubular lumen (Figure 3). Tubules in all three subcategories of AT were followed on serial sections from the urinary pole of the glomerulus until epithelial cells with brush border were observed or further tracing was not technically feasible. The severity of tubular injury was scored as 1 for NT, 2 for SAT, 3 for LAT, 4 for ATNO, and 5 for AG. The mean score of all glomeruli in each biopsy was expressed as the index of junctional atrophy (IJA). Fractional volumes of cortical interstitium [Vv(Int/cortex)], proximal tubules [Vv(PT/cortex)], and distal tubules [Vv(DT/cortex)] were obtained by point counting using a double lattice grid with coarse points 25,000 μm apart and fine points 12,500 μm apart. Points falling on medulla, large vessels (with a profile larger than a medium tubule or surrounded by adventitia), and technically damaged tissue were not counted. Points falling on TBM were not counted as interstitium. Measurements were done on eight non-overlapped fields at 300× starting at the first section of the stack. If there were not enough fields on the first section, a second section 200 μm deeper in the slide stack was used to complete the measurements in an area of the biopsy with new glomeruli. If necessary, a third section was sampled on the same basis. Four hundred and fifty fine points were counted, on average, per biopsy, yielding around 250 fine points over interstitium. Figure 2. A glomerulus attached to a long atrophic tubule (LAT). * The lumen of the attached tubule. Followed by serial sections, atrophic proximal tubular epithelial cells in (i) are replaced by taller cells with brush borders in (iv); arrow, tip lesion; N, a Kimmelstiel-Wilson nodule at the tip lesion; arrowhead, a capsular drop followed in sequential sections. Figure 3. A glomerulus attached to an atrophic tubule with no observable opening into the glomerular urinary space (ATNO) on serial sections (i-iv); arrowhead, a tip lesion; arrow, the residual lumen of the atrophic tubule; double arrowhead, reduplicated Bowman’s capsule; N, a Kimmelstiel-Wilson nodule at the site of the tip lesion. Tissues were fixed in 2.5% Millonig buffered glutaraldehyde and embedded in Polybed 812 and studied by EM as previously detailed (27). Three glomeruli per biopsy were studied, except in one case in which only a single glomerulus was available. Ultra-thin sections were stained with uranyl acetate and lead citrate and examined with a JEOL 100CX electron microscope (JEOL, Tokyo, Japan). Images were examined at 3900× for estimating fractional volumes of mesangial components and surface density of the peripheral glomerular basement membrane per glomerulus [Sv(PGBM/glom)] and at 11,700× for estimating glomerular basement membrane (GBM) thickness. Fractional volumes of mesangium [Vv(Mes/glom)], mesangial cells [Vv(MC/glom)], and mesangial matrix [Vv(MM/glom)] were estimated by point counting (27), Sv(PGBM/glom) by using a line grid (28), and GBM width by the orthogonal intercept method (29). Data are expressed as mean ± SD, except where indicated. Unpaired t test and one-way ANOVA were used to compare the mean values if there were two or more than two groups, respectively. The least significance difference (LSD) post hoc test was used where applicable. Pearson product-moment correlation or Spearman rank order correlation were used to evaluate relationships between variables. Median and Kruskal-Wallis ANOVA tests were used to test for differences in the percent of tip lesion among different categories of glomeruli. Multiple regression analyses with stepwise forward deletion were used to create structural-functional relationship models. P < 0.05 was considered to be significant. All diabetic patients were proteinuric, and GFR was low (<90 ml/min per 1.73 m2) in six patients (Table 1). Six patients were hypertensive. Glycemic control (HbA1C) was relatively poor (Table 1). Diffuse mesangial expansion varying from mild to severe was seen in the LM slides from all diabetic cases. Nodules were less frequent than diffuse mesangial expansion. Single nodules were often associated with tip lesions (see below). Atubular glomeruli and glomeruli attached to atrophic tubules were not discernible from glomeruli attached to normal tubules by examining their tufts on single profiles, except that the presence of a tip lesion made the finding of an abnormality in the glomerulotubular junction more likely. Arteriolar hyalinosis and capsular drops were other separate findings. Glomerular lesions related to glomerulotubular junction abnormalities are described below. Vv(Mes/glom), Vv(MM/glom), and GBM width were increased, and Sv(PGBM/glom) was decreased in diabetic patients compared with controls; there was no difference in Vv(MC/glom) (Table 2). Mean GV, the SD for GV, and the coefficient of variation of GV were higher in diabetic patients than controls (Table 2). Vv(Tuft/corpuscle) was not different in two groups. %SG was greatly increased in diabetic patients. The coefficient of variation for GV was correlated with %SG (r = 0.82, P < 0.05). Segmental sclerosis was not observed in glomeruli of normal cases (Table 2). Atrophic tubules were followed from glomerulotubular junction downstream on serial sections. At the beginning of the atrophic proximal tubules, epithelial cells were flat, without brush borders, and resembled parietal epithelial cells. All atrophic tubules (SAT, LAT, or ATNO) (5 of 35 atrophic tubules were excluded because of technical artifacts) were covered by normal or near normal epithelial cells with brush borders in more distal parts (Figure 2). Flat epithelial cells in SAT were abruptly followed by normal-looking epithelial cells without cells of intermediate morphology. Flat epithelial cells in LAT and ATNO were followed by gradual transition to short epithelial cells that, further on, acquired brush borders. This transition usually began within a short distance from the glomerulotubular junction (typically less than thirty sequential 5-μm sections). However, in one biopsy, where tubular atrophy and interstitial expansion was prominent, the extent of the tubular atrophy was relatively long, persisting for approximately eighty sections from the glomerulotubular junction. 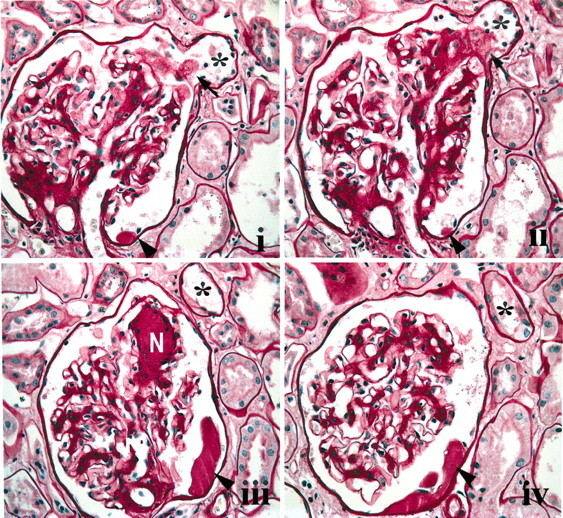 The frequency of tip lesions varied with the pathology observed at glomerulotubular junction. Tip lesions were invariably present in SAT, while they were infrequent in NT (Kruskal-Wallis ANOVA and Median test, χ2=32.4, df = 4, P < 0.00001, Table 3). Twenty-two percent of AG had tuft to Bowman’s capsule adhesions at a site opposite to the vascular pole, approximately where a tubular attachment would be expected. The volume of glomeruli attached to NT was greater than any other category of glomeruli (Table 3). To eliminate the effect of inter-biopsy variations in GV, the volume of each glomerulus was divided by the mean GV for that biopsy, providing the relative glomerular volume (RGV). RGV was lower in AG than any other category of glomeruli (Table 3). Vv(Tuft/glom) was not different among groups (Table 3). GV coefficient of variation was positively correlated with the percent of glomeruli attached to ATNO (r = 0.75, P < 0.05). There was a negative correlation between GV and index of junctional atrophy (IJA) (r = −0.93, P < 0.05). No relationship was found between the presence of tip lesions or existence of AG and any of EM glomerular structural parameters studied. The tubular basement membranes of atrophic tubules were unevenly thickened and wrinkled and were intensely PAS-positive (Figure 1C). Atrophic tubules in a background of expanded interstitium were seen around glomeruli with advanced periglomerular fibrosis (Figure 1C). Profiles of atrophic tubules appeared to be focally distributed with modest-to-moderate interstitial expansion and mononuclear cell infiltration around them. Hypertrophic proximal tubules marked by dilated lumina and hypertrophic epithelia were seen along with focal tubular atrophy. Vv(Int/cortex) was increased in diabetic patients (Table 2). Vv(PT/cortex) and Vv(DT/cortex) were decreased in diabetic cases (Table 2). Vv(PT/cortex) was negatively correlated with %SG and Vv(Int/cortex): r = −0.80, P < 0.05; r = −0.73, P < 0.05, respectively. GFR was negatively correlated with Vv(AT/cortex) (r = −0.74, P < 0.05). AER was positively correlated with %SG (r = 0.78, P < 0.05) and negatively with Vv(PT/cortex) (r = −0.81, P < 0.05). However, there was no significant correlation between AER and Vv(DT/cortex). Multiple linear regression analyses showed that predictor variables of mean glomerular volume, Vv(Mes/glom), Vv(MM/glom), Vv(MC/glom), Sv(PGBM/glom), and GBM width accounted for 66% of the GFR variability in these proteinuric diabetic patients (Model A) (adjusted r2 = 0.66, P < 0.06) (Table 4). However, using %SG, percent of glomeruli with tip lesion (%Tip) and %AG, Vv(Int/cortex), Vv(PT/cortex), Vv(AT/cortex), and mean IJA as predictor variables for GFR (Model B), adjusted r2 was increased to 0.94, P < 0.05 with Vv(AT/cortex), %AG, and %Tip as the main predictors (Table 4). Proteinuric patients with more than 20 yr of type 1 diabetes and renal function ranging from normal to moderately impaired were selected to study atubular glomeruli in diabetic nephropathy. These cases were selected with the anticipation, as confirmed here, that they would have typical diabetic nephropathy changes (30) while avoiding cases with GFR <50 ml/min per 1.73 m2, because more advanced cases would be expected to be approaching end-stage renal disease and would likely have widespread global glomerulosclerosis and advanced tubulointerstitial injury. Atubular glomeruli are reportedly common in experimental and human renal disorders (5,6,9,10,13,31 ⇓ ⇓ ⇓ ⇓ ⇓). Pagtalunan et al. (16), on the other hand, did not observe atubular glomeruli in type 2 diabetic Pima Indian patients with albuminuria ranging from normal to overt proteinuria. Our study, disclosing a high frequency of atubular glomeruli in type 1 diabetic patients, fits better with Marcussen’s observations of atubular glomeruli in proteinuric diabetic patients (unspecified as to type of diabetes) with moderate to severe renal function impairment (1). Marcussen suggested that glomeruli attached to atrophic tubules probably lacked function (10). However, in the process of searching for atubular glomeruli, we found a surprisingly high frequency of glomerulotubular junction abnormalities despite well-preserved renal function in our cases. Thus our data strongly suggest that at least some glomeruli with abnormal tubular junctions must be contributing to GFR. This led us to subclassify glomerulotubular junction abnormalities beyond the three previously established categories of glomeruli attached to normal tubules, glomeruli attached to atrophic tubules, and atubular glomeruli (1). Considering that tubular lumina are far more open in perfusion-fixed compared with immersion-fixed renal tissues, the prevalence of glomeruli attached to atrophic tubules with no observable glomerular opening (ATNO) may be overestimated. Thus, some ATNO glomeruli may, in fact, be LAT and functional. However the appearance of some ATNO glomeruli, with fibrous tissue traversing the entire glomerulotubular junction, makes it likely that the function of at least some of these glomeruli would be substantially limited. Along these lines, tip lesions were commonly found in association with glomerulotubular junction abnormalities. In fact, short atrophic tubules (SAT) were invariably associated with tip lesions, suggesting a possible causal relationship between these two phenomena. Our findings of flat tubular epithelial cells, without brush borders, at the very beginning of the proximal tubule and occasional glomerular tuft prolapse into tubule were similar to previous observations in other renal disorders (19,32 ⇓). On the basis of electron microscope studies, Howie et al. (32) suggested that these abnormal proximal tubular cells had the appearance of an intermediate form between glomerular parietal epithelial cells and proximal tubular cells. In another study of proteinuric patients, Howie (33) showed that these cells expressed epithelial membrane antigen, which, normally, is only expressed in the distal tubules, collecting ducts, and in a few flat cells in the abrupt transition from parietal epithelial cells to proximal tubular epithelial cells (33). This same study also described an abrupt change from these flat cells to normal-looking proximal tubular epithelial cells in glomeruli with tip lesions, a finding we confirmed in glomeruli with SAT. However, a gradual transformation from flat to short epithelial cells without observable brush borders to taller more normal-appearing epithelial cells with brush borders was observed in long atrophic tubules (LAT) and atrophic tubules with no observable opening to the glomerular urinary space (ATNO). Whether these short epithelial cells are intermediate forms between normal and flat epithelial cells or represent migration of parietal epithelial cells, or cellular transdifferentiation, cannot be determined by this study. Bowman’s capsule thickening was minimal in glomeruli with SAT, whereas marked thickening, reduplication, and wrinkling of Bowman’s capsule, especially close to the glomerulotubular junction, was always observed in LAT and ATNO. This suggested that progression of Bowman’s capsule damage paralleled the severity of tubular atrophy. The lightly stained material we observed between the two layers of the reduplicated Bowman’s capsule was similar in distribution and in association with tuft adhesion to the amorphous material described by Javaid et al. (14) in adriamycin nephrosis. These authors, as originally postulated by Kriz et al. (34), suggested that extravasation of glomerular filtrate through parietal epithelial cells, extending around the tubular take-off and proximal portion of the proximal tubule, led to tubular atrophy. Howie’s (17,32 ⇓) observations, indicating especially severe podocyte damage and foot process fusion at the site of tip lesions, could be consistent with this hypothesis. Moreover, Bowman’s capsule changes in most atubular glomeruli were similar to those seen in LAT and ATNO and occurred where the tubular take-off was expected. This is consistent with the concept that LAT and ATNO are precursors of AG. On the basis of our observations, we suggest the following tentative scenario: whether proteinuria causes podocyte damage, or vice versa, or both are true, proteinuria is associated with tubular cell damage (35). For example, increased apoptosis of tubular epithelial cells occurs in proteinuric rats (36) and angiotensin-converting enzyme inhibitor treatment lowers proteinuria and effectively prevents glomerulotubular disconnection, possibly by reducing proteinuria, in Heymann’s nephritis in rats (37). We suspect that the cells lining the proximal portion of the proximal tubule may be particularly susceptible to injury associated with proteinuria. We assume that the combination of proximal tubular cell and podocyte damage increases the probability of tuft adhesion at the glomerulotubular junction. 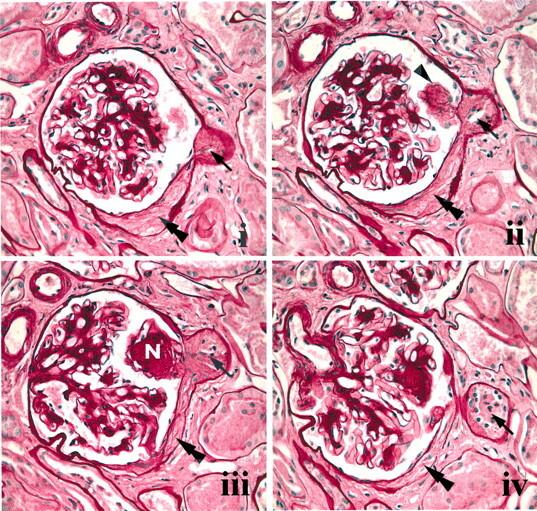 It is possible that glomerular capillary microaneurysm formation leads to local podocyte damage out of proportion to that associated with proteinuria alone. If so, this could explain the observed association of microaneurysms and Kimmelstiel-Wilson nodules at the site of tip lesions in these proteinuric diabetic patients. We assume that the local events associated with tip lesions lead to Bowman’s capsular closure over the tubular take-off site and, thus to AG. The finding of AG with normal-appearing glomerular tufts and Bowman’s capsules was uncommon in our study. This contrasts with the mostly normal-appearing AG described by Marcussen et al. (1). These differences suggest that different pathogenetic mechanisms may lead to atubular glomeruli in diabetic nephropathy (1,38,39 ⇓ ⇓). The observations detailed here derive their potential importance, at least in part, from the assessment of structural-functional relationships. In other studies (40), the structural changes that best related to albuminuria in type 1 diabetic patients with normal to moderately impaired GFR (≥ 45 ml/min per 1.73 m2) were GBM width and Vv(Mes/glom), while measures of glomerular filtration surface density, reduced in proportion to mesangial expansion, was the closest inverse correlate of GFR. However, structural measures explained a much larger proportion of the variability in AER (≈60%) than GFR (≈30%) in these patients (40). Vv(Int/cortex) and percent of global glomerular sclerosis improves the structural prediction of GFR in type 1 diabetic patients (41), but most of the GFR variability (≈60%) remains unexplained. Given the high frequency of atubular glomeruli seen in the proteinuric type 1 diabetic patients in the present study, it is reasonable to expect that this previously unexplored structural parameter would help to reduce the residual unexplained variability in GFR in this disease. In fact, multiple regression analyses in this study showed a significant inverse relationship of GFR with AG, Vv(AT/cortex), and percent of glomeruli with tip lesions. However, the relatively narrow range of GFR of patients in the present study might have limited our capacity to delineate structural-functional relationships, which may be more clearly seen in a wider spectrum of disease. On the basis of the observations reported here, it seems reasonable to proceed with more extensive studies of these phenomena in type 1 diabetic patients. Such studies, moreover, may be even more relevant in type 2 diabetes, where there is greater structural heterogeneity (42). Renal pathology in type 2 diabetes is often characterized by tubulointerstitial, glomerulosclerotic, and vascular lesions out of proportion to diabetic glomerulopathy lesions (42), and, in this pathologic setting, it is likely that the phenomena described here may be even more important. The decreased fractional volumes of proximal and distal tubules per cortex [Vv(PT/cortex) and Vv(DT/cortex)] and increased Vv(AT/cortex) in diabetic patients compared with control subjects in this study were in accordance with Marcussen’s findings (1). The inverse correlation between Vv(PT/cortex) and AER may be due to the toxic effect of proteinuria on proximal tubules and/or an increase in protein excretion secondary to reduced reabsorption after tubular injury (35). This study showed that even in ATNO, where at the very beginning of the tubule, no open lumen is observable, more distal parts of the tubule become normal. This suggests a segmental distribution for tubular atrophy. Whether the process of atrophy starts at glomerulotubular junction and progresses distally or happens in a beaded distribution, as observed in advanced ischemic tubular atrophy remains to be determined through further studies (43). It should however be remembered that tubules related to globally sclerotic glomeruli were not studied. Glomeruli, as expected (44), were generally larger in these proteinuric diabetic patients than control subjects. Glomerular volume was also more variable in these diabetic patients. AG were in the lower range of glomerular volume. Examination of relative glomerular volume (RGV), which removes between-case glomerular volume variations, confirmed that AG are significantly smaller than other glomeruli in a given biopsy (1). Glomeruli attached to normal tubules (NT) were the largest ones, possibly partly due to the nature of diabetic glomerulopathy itself (44), and partly because of compensatory hypertrophy secondary to sclerosed and atubular glomeruli (7,8,10 ⇓ ⇓). Increased glomerular volume in the remnant kidney model is associated with the development of focal and segmental glomerulosclerosis (45). In this sense, large glomeruli with normal tubular attachments may be especially vulnerable to detrimental changes leading to the progressive renal functional impairment observed regularly in the proteinuric stage of diabetic nephropathy. 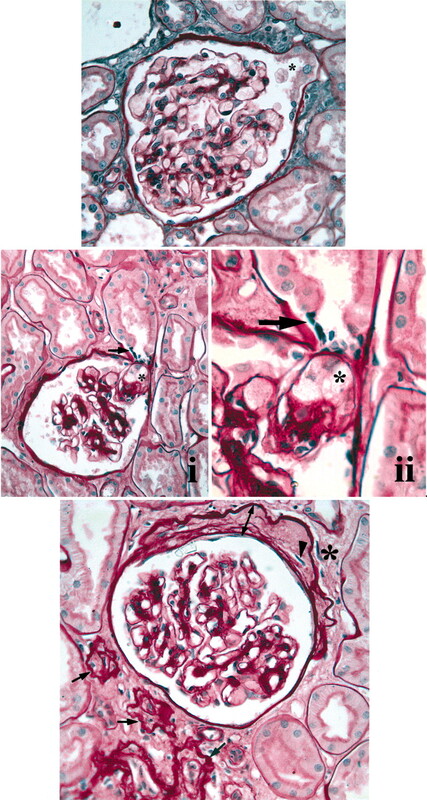 In summary, this detailed study of atubular glomeruli, tip lesions, and glomerulotubular junction abnormalities suggests an important pathogenetic role for these lesions in the development and progression of renal insufficiency in diabetic nephropathy. Moreover, if these lesions are in part the consequence of proteinuria, this might partially explain why treatment leading to reduction in proteinuria might help to preserve filtration function in diabetic nephropathy. These studies were supported by grants from NIH (DK 13083) and National Center for Research Resources (M01-RR00400). We thank John Basgen and Thomas Groppoli for assistance in the electron microscopy and stereological studies and Stephanie Reed for preparing tissue sections.